According to the latest Barron’s “Big Money Poll”, the professional investors are fairly bullish but not excited about stocks (see graph). 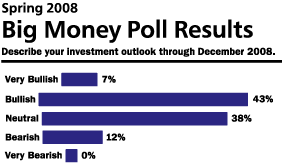 But the majority, 55%, believe the market to be undervalued. And 87% say they see themselves as buyers within 3-6 months. The remaining 13% see themselves as seller in that time frame. The American Association of Individual Investors sentiment survey continues to be problematic for bulls. From a contrarian point of view, the ideal is if sentiment remains unchanged or even falls in the face of a market rally. What we are seeing however is the opposite. As the market has recovered, the AAII sentiment survey has shown an alarming increase in bulls. I mentioned this last week in the sentiment overview and unfortunately, things have gotten slightly worse. Now only 26% of AAII respondents are bearish and 53% are bullish. There is no way we can discount or ignore this. Such a high level of bullishness is downright frightening - from a contrarian point of view. The last time we had this many bulls in the AAII was in October 2007 when the market put in its swing high. I’ve been also noticing technical indicators also pop up showing a potential for the recovery to stall. So while in the short term we might be in for some turbulence or even a set back, I still think there are enough things in place for a protracted bull market. According to AMG Data, for the first 3 months of 2008 equity funds had a net outflow of $29.7 B - including ETFs. Domestic funds had an outflow of $22.5 B. By March the panic was apparently over and mutual funds and ETFs once again had net inflows: $14.7 B for the month. Net outflows during corrections tells me that the retail investor isn’t stubbornly clinging to hope. But selling in fear that things will get worse. But in the end, the market needs inflows to be able to power ahead. When you combine the healthy return of inflows to mutual funds and ETFs with the limited supply of securities due to a lack of IPOs, and secondaries as well as the further restriction of supply through continuous buy-back programs, you have the right setting for a powerful bull market. The Sage of Omaha believes that “the worst of the crisis in Wall Street is over”. In an interview he said that he supported the Bear Stearns buyout because there was a real risk of contagion had it fallen. He also thinks “the Fed did the right thing” by stepping in and acting as a direct lender to the financial companies in need. Of course, this is little consolation to those who are being squeezed by the mortgage crisis but from a trading or investment point of view, it is nice to have someone like Buffett confirm that Armageddon was averted. At the same time, Buffet - unlike Richard Russell - is not a raging bull. He thinks that we will see moderate future growth, much less than in the past decades. This isn’t really sentiment, as such, but I include it because it dovetailed nicely with Barron’s poll results where most respondents believe the stock market to be undervalued. Ford Equity Research uses a proprietary measure to determine valuation for a company. They take the market price of the company’s stock and divide by value, derived from “a proprietary intrinsic value model”. According to Ford, 40% of the almost 1,800 US stocks it tracks are undervalued. This, by itself, wouldn’t mean much except that this measure has an enviable track record. The previous times that it showed a higher percentage of stocks undervalued was at the end of 2002, as the bear market ended, with 48% of the stock universe undervalued. The second instance when there were more than 40% of stocks undervalued was in 1998, during the Asian financial crisis (also known as the LTCM debacle). you mixed it up a little bit: 1997 was the Asian financial crisi, 1998 was the Russian default which broke the neck of LTCM. What is one to make of Barron’s Institutional Survey? Is there some sort of historical data for how these numbers relate to future price movements? that’s a good question. Jason did a report on this recently. I suggest getting a free 14 day trial and checking it and his services out. Highly recommend it.